Forecasting Tool is a complex solution of sales forecasting developed by us. It creates sales forecast for individual products with regard to the needs of individual customers. It enables both fully automated forecasting and manual forecasting by designated planners. A key function of the tool is to support communication between planners and account managers who communicate with customers. Sales volume in some markets of our client had been increasing for a certain period of time. Although the client had a standard forecasting software, the software was unable to take into account seasonal peaks and customer habits and requirements. It resulted in a very high ratio of undelivered products. That is why we developed the tailor-made Forecasting Tool. It uses its own forecasting algorithms and, above all, allows the client to plan sales according to the demand of his customers. At the same time, the tool can run independently of other forecasting software. It can also be modified or extended by additional functionalities based on client´s needs. For its functioning Forecasting Tool does not need anything else than the standard MS Office environment and standard network file location settings. The client did not have to invest in the purchase of special software or licenses. At a reasonable cost for development, he could efficiently solve prediction problems across all segments and markets simultaneously. From the perspective of users, that is planners and key account managers, the Forecasting Tool is very easy to work with. The planner sees a well-arranged SKUs. For every SKU there are weekly forecasts for the upcoming 6 months. The forecast is also reflected in a graph, which also shows the volume of sales in the same period last year. If the planner wants to adjust the forecast amount of any product, he or she simply types in a new value. The tool than processes it automatically. As soon as the planner is ready with the forecast, the key account managers can get to work. 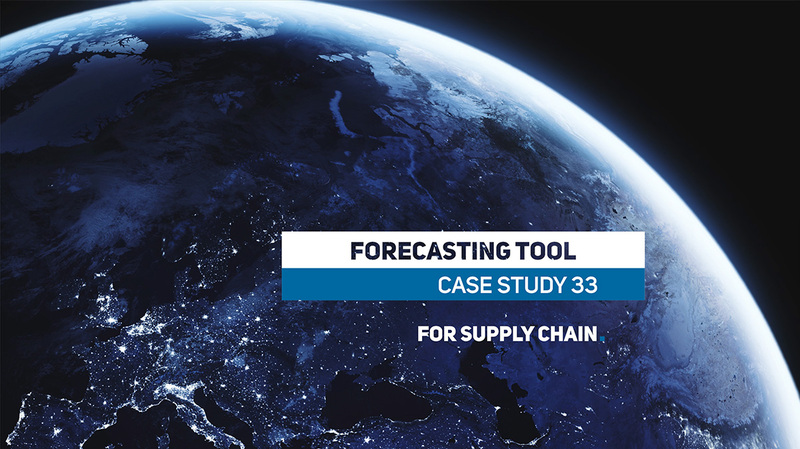 They have their own module available in the Forecasting Tool, where they can adjust the forecast in a similar way as the planner, but for a specific customer. The resulting forecast goes back to the planner, who has the final say on the final forecast. Users are logged into the Forecasting Tool and any changes to the forecast are recorded and traced back to the user. This allows the management to have an overview and give feedback. Forecasting Tool uses a specific algorithm to calculate forecasts. It works with sales data of individual products from past 24 months sorted by weeks. In addition, due to the client’s situation, we set the tool to display primarily the SKUs that are most at risk of running out of stock. With tens to hundreds of SKUs in each segment and weekly data updates, processing input data for prediction requires significant computing capacity. For this reason we developed a stand-alone computing module. It performs calculations so that the forecasting section of the tool displays only clean calculated data. For maximum user convenience, the computing module is fully automated. After inserting the sales data for each SKU in the last week, it performs all the necessary calculations with just one click on one button. At the beginning of our cooperation we also provided the client with weekly updates of input data. But the tool can be handled by anyone who has basic MS Office skills. The calculation is optimized to be as fast as possible. The computing module is also ready to run in one of the cloud server solutions for even faster calculations. Every change of forecast in Forecasting Tool is automatically tracked. It is recorded in a log file that is automatically sent to a location in client´s network. The log file tracks the changes for purposes of reverse analysis. Forecasting Tool provides an overview of changes that gives the management a quick overview of forecast development. It functions as a basis for feedback to planners and sales representatives / account managers. 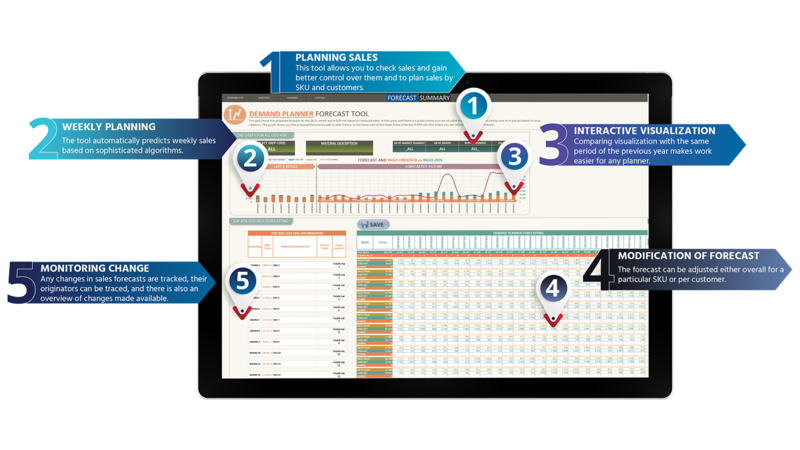 The Forecasting Tool developed for our client covers sales forecasts across all segments on several markets. We have also developed additional Orders&Deliveries History Tool. Our other solutions in the Forecasting area include Days of Supply Report or SKUs Availibilty Report.